AAAAH MY DESCRIPTION GOT DELETED TWICE! STUPID MYSQL ERROR! This is the third time I'm retyping this. Dangit. HAPPY BIRTHDAY TO CLOUD9_ALICE-SAMA AT LIVEJOURNAL! Yay! 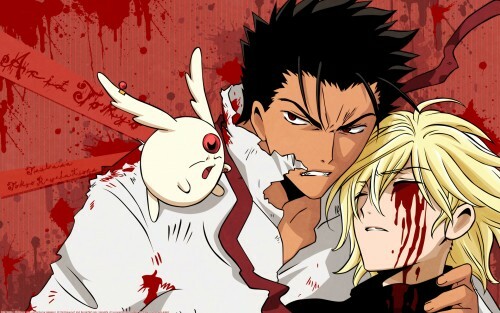 I'm sure any KuroFai fans will enjoy this *nudge Jov nudge*. this is like my first wall with Kurogane as the main focus (and there's still Fai in it too! :D). School's out for me! Yaaaay! I'm going to an anime convention next Saturday, I'm going Fye hunting! Yahoooooo! It's taken two weeks to do this wallpaper. Vectoring was easy enough, just annoying with all the text covering it. I don't like redrawing, I'm not good at it xD. But it looks alright. The background is based off of my wallpaper, "My Abstract World". I love using all those splat brushes! It turned out a lot brighter than I thought it would be though xD. I haven't done cell shading for a while, it's been all softy and smudgey. Easiest part: The background xD. Hardest part: Vectoring Kurogane's eyebrows! You don't know how hard it is to get them right, they looked like fuzzy little caterpillars before! Funnest part: Adding them fancy shadows to Fye's hair. Dammit I love his hair! Will add more to the description later, I'm just annoyed, this is the 3rd time! Truly I wanted to vector this, too. Now you did it and I can forget about the effort I had put into it otherwise. Keep up your wonderful works of TRC, imouto-chan. This vector is amazing! Great job! ^.^ And keep it up! Wow! Is really very cool! Keep up the awesome work! As much as I feel sorry for Fye, I can't help but get all squirmy in my chair whenever I see these two together! Anyway, the vectoring is neatly done and the simple background works well with this type of scene. Great job! OMG! It's awesome Aqi! Even though it is very sad scene, Fye still looks gorgeous. Definitely one of your very best vector art/wallpaper of the KuroganexYuui pairing so far! Neat, clean, clear, good use of brushes...etc.. They look like lovers (: Not that it's a bad thing! Oh now, this is just amazing. I'm not reading/watching Tsubasa at all but this wallie caught my attention because it features a great, unique atmosphere. Everybody, please full view this, it's perfect! Simple and perfect. It looks like a movie poster! Sad, but very pretty wallie! Thanks so much for your effort! can you tell me when was this part in manga when he lost his eye? great, great,.... i like it .. a lot..
kurogane is so hot.. i love it..
Chapter 106/107 begins the Tokyo arc. OH NO FAY! FAY IS SOO GORGEOUS!